A fanciful cake made up of both chocolate and confetti cake layers, whipped buttercream and Oreo frosting. To top it off? A drippy chocolate glaze and sprinkles, of course! I recently read a piece about how to be a better recipe writer. In the piece was a quote from Ina Garten. I can’t remember what it said exactly, but it basically stated that Ina tries to make the star ingredient of each of her dishes shine by adding the least amount of supporting flavours in order to make it taste amazing. For example, if she were to make a plum tart, it better taste like plums - with maybe only a few spices and citrus to help bring out the natural flavours of the plums. Nothing overly complex or unnecessarily complicated. This cake it not that. This cake takes all of our childhood dreams and crams them into one unapologetic layer cake. 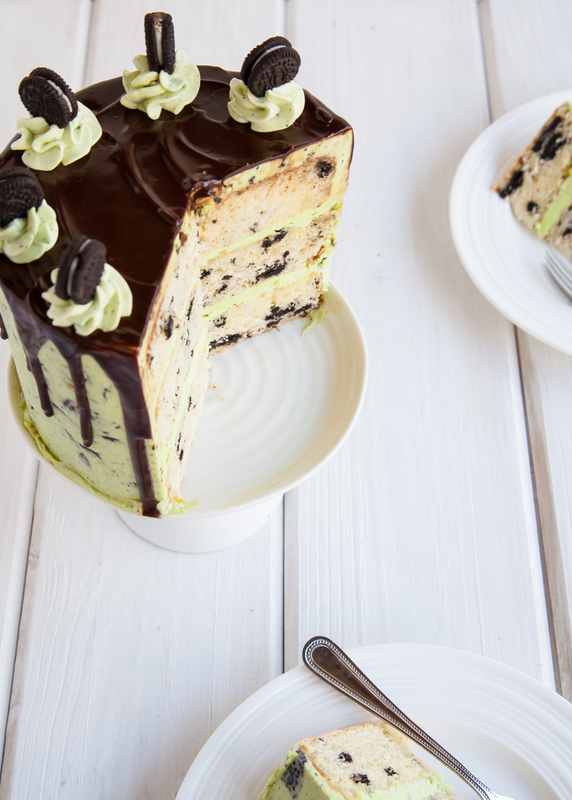 This cake combines Oreos and confetti cake to make one epic birthday cake. No, this cake is not for a child. It is for my husband. The man with a bigger sweet tooth than me. And while he turned 33 years old this morning, you would never guess it if you could hear him giggling as he chases our screaming (with delight) toddler around the living room as I type this up. May you always stay young at heart, Brett! Happy Birthday - we love you! Pre-heat the oven to 350-degrees F. Grease and flour two 6-inch round cake pans and set aside. In the bowl of an electric mixer, mix the butter on medium until smooth. Add in the sugar and mix on medium-high until fluffy and pale in colour. Stop the mixer and scrape down the bowl. With the mixer on low, add in the vanilla and egg yolks, one at a time. Mix until incorporated. With the mixer on low, add the dry ingredients and milk in alternating batches. Mix just until the batter is incorporated. Do not over-mix. Fold in the sprinkles until combined. Evenly distribute the batter into the prepared pans and bake for 24 to 28 minutes, or until a toothpick inserted into the center of the cakes comes out clean. Let cool on a wire rack from 10 minutes before removing the cakes from their pans. In the bowl of an electric mixer, mix together the oil and sugar until combined. With the mixer on low, add in the vanilla and egg, and egg yolk. With the mixer on low, add the dry ingredients and milk in alternating batches. Mix just until the batter is incorporated. Stream in the hot coffee and mix until combined. Using an electric mixer, beat the butter and cream cheese together on medium until smooth. With the mixer on low, gradually add in the remaining ingredients. Once the sugar begins to incorporate, turn the mixer up to medium-high and mix until light and fluffy (3 to 5 minutes). Adjust the sugar and cream quantities until desired consistency is achieved. Fold in the crushed cookies into the remaining buttercream after the cake has been filled and the crumb coat has been applied. If you wish to have colored Oreo frosting, be sure to add in the food coloring before the cookies to keep from over-mixing and the frosting from turning grey. In a small saucepan over medium heat, melt down the butter and corn syrup. Once hot, pour over the chocolate and let stand 30 seconds. Add a pinch of salt and whisk until smooth. Allow glaze to cool (but still runny) before dripping on the cake (about 10 minutes in the refrigerator). Once the cakes have cooled, trim them so that all of the layers are the same height. Place one of the chocolate cake layers on a cake board or serving dish. Spread on about 1/2 to 3/4 cups whipped vanilla buttercream. Top with one of the confetti cake layers and repeat. Crumb coat the cake with the whipped vanilla frosting. Reserve some plain vanilla frosting for piping details (if desired) before tinting the frosting. Tint the frosting the colour of your choice then fold in the oreo crumbs. Frost the cake with the Oreo frosting then chill until firm. Once the cake has chilled and the glaze has cooled, use a spoon to apply drips around the edges of the cake. Fill in the center and spread with an offset spatula. Add sprinkles before the glaze sets. Use any remaining frosting to pipe swirly peak with a star tip in the center of the cake. Top with more sprinkles, if desired. For more drippy cake tips, click HERE! I love love mint, but I sometimes feel like I am the only one. Please correct me if I am wrong. Mint lovers, unite! Mint is likely not a hated flavour, but in a world of strawberry, cookie butter, and Nutella, it is probably low on most people's list of flavors they'd like to see turned into a cake. Sometimes to you have to pull some pretty cheap tricks in the kitchen. Like hiding zucchini in brownies or pureed carrots in mac 'n cheese for picky kids - or whatever clever moms keep up their sleeves. Since I am skeptical of the world's enthusiasm for mint, I figured I'd better trash up this recipe to make sure everyone was on board. Make it totally irresistible. Something even mint cynics could not turn down. A twist that turns the classic combination of chocolate and mint into something totally outrageous and whimsical. Time to pull out the big guns - Chocolate Sandwich Cookies! Better known as just plain ol' Oreos. And who can say no to Oreos? Nobody. 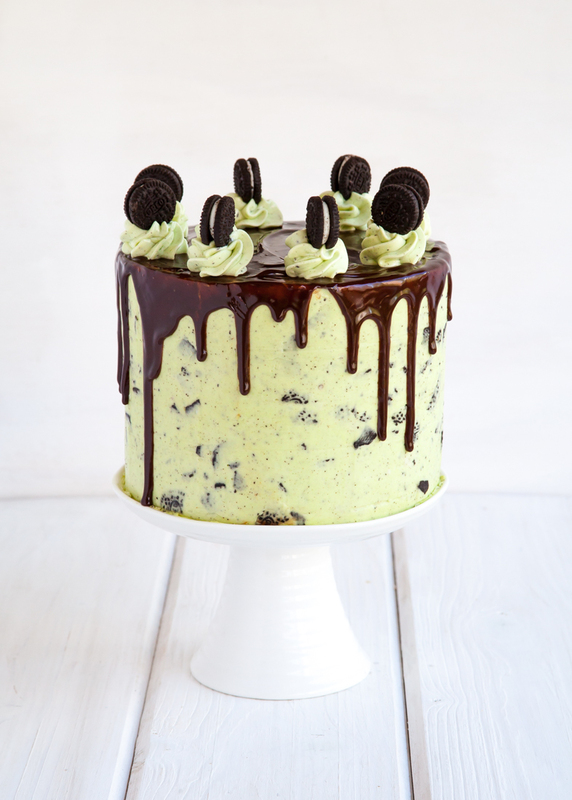 This Mint Cookies and Cream Cake exudes, even oozes FUN! Inthe way sprinkles make up a "Funfetti Cake," I threw crushed-up cookies straight into the batter and buttercream. 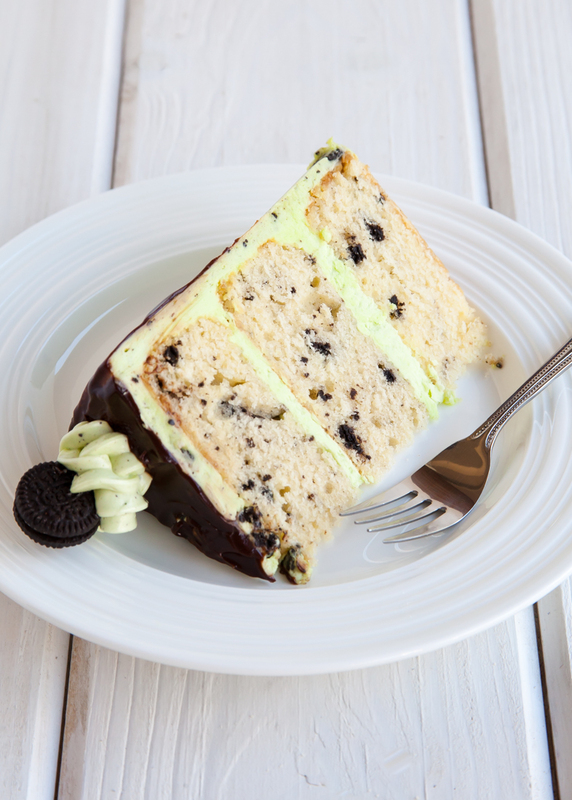 Layers of cookie-studded vanilla cake are paired with a silky mint buttercream then smothered in minty, crushed cookie mint buttercream. Top take it over the top, I drizzled the frosted cake with chocolate glaze and finished it off with swirls of extra buttercream and mini Oreos. 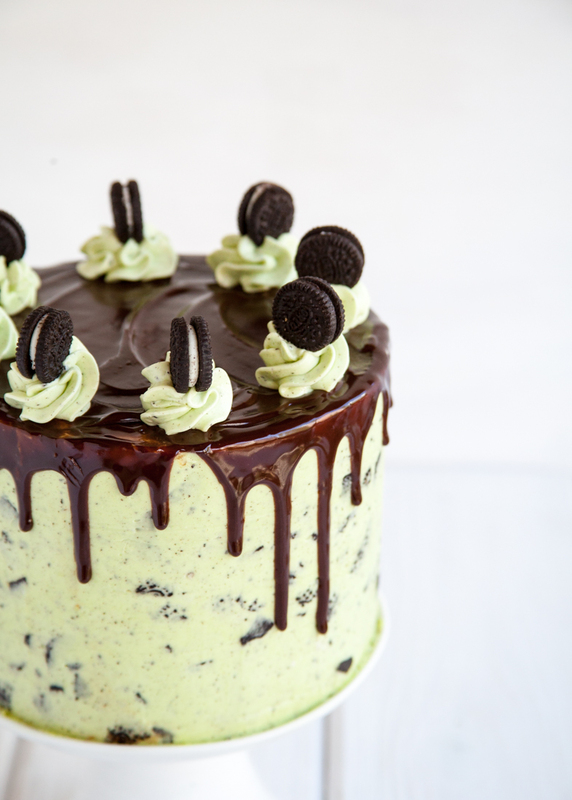 Now who could resist a slice of this mint, chocolaty, COOKIE goodness? 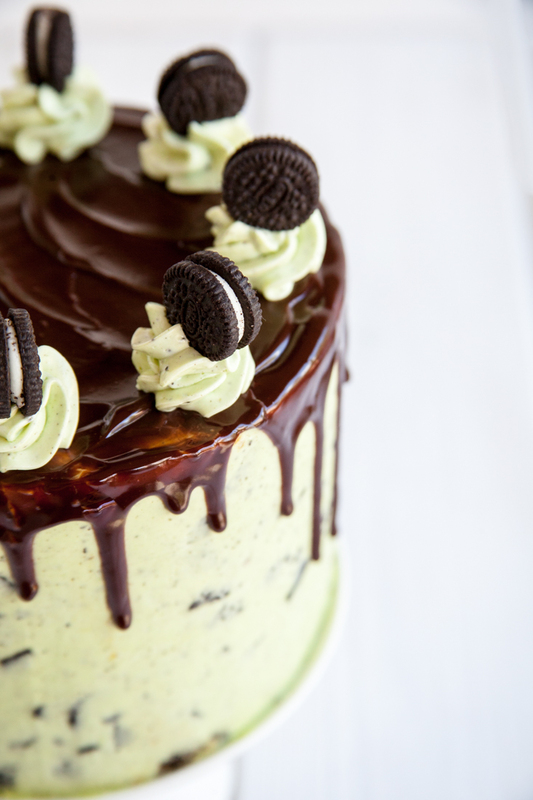 Find the recipe for this Mint Cookies and Cream Cake on The Cake Blog!